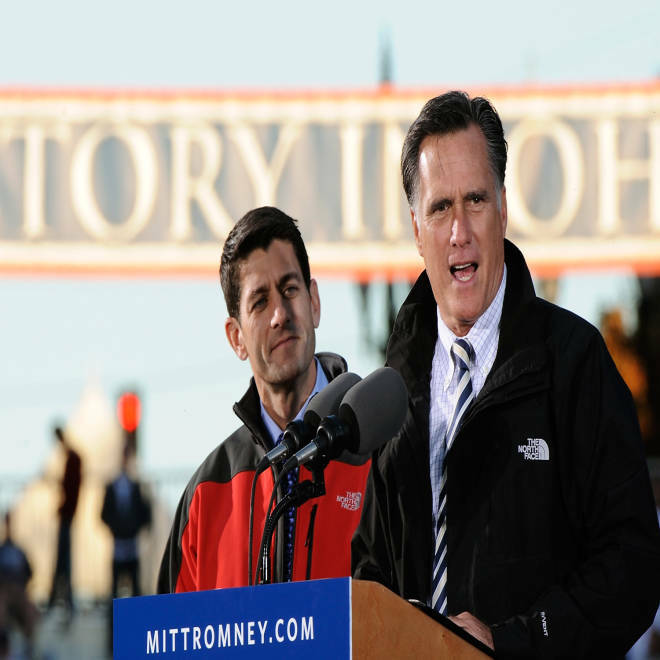 Republican presidential candidate Mitt Romney and Republican vice presidential candidate Paul Ryan, speak on stage Friday at a rally in Lancaster, Ohio. LANCASTER, Ohio — Campaigning with his running mate on Friday in the battleground state of Ohio, Mitt Romney praised Paul Ryan’s performance the previous night in the vice presidential debate. "We got to watch this guy debate and there was one person on the stage with thoughtfulness, who was respectful, who was steady and poised. There is one person on that stage you’d want to be with if there were a crisis — it is this man right here," Romney said at sunset in the Lancaster Town Square. Ryan also mentioned how he squared off with Vice President Joe Biden: "You have a huge choice to make. We have a big choice to make. You know, I think we saw a sign of it last night just like we saw it a week ago. You see, they are offering no new ideas. The president is simply saying more of the same. Hope and change has become attack and blame." Ohio Sen. Rob Portman, Romney’s debate partner, joined in the debate chatter as well, telling the crowd: "We’ve had two great debates in the last eight days." President Barack Obama’s campaign spokesman, Lis Smith, disagreed with the Republican’s assessment of Thursday night’s debate in Danville, Ky.
"Mitt Romney and Congressman Ryan were awfully defensive about last night’s debate at their event in Ohio. It’s no surprise why -- Vice President Biden unmasked their real agenda," she wrote in a statement. Romney and Ryan last campaigned together in another crucial state — Virginia — and that rally was the night following Romney’s first presidential debate. The GOP ticket is continuing to crisscross the country as recent poll numbers show a tightening race. "I've had the fun of going back and forth across Ohio and this week I was also in Florida and Iowa; I was in North Carolina, in Virginia and, you know what, there is a growing crescendo of enthusiasm people recognize that this is not an ordinary campaign; this is a critical time for the country; there is more energy and passion; people are getting behind this campaign; we're taking back this country," the Republican presidential nominee told the several-thousand person crowd Friday night. While Romney and Ryan campaign separately Saturday, both candidates remain in the Buckeye State – only further emphasizing the significance of the Midwestern state on Nov. 6th.